Chia Seeds provide a major source of Omega 3 in the form of ALA. It is well known that Omega-3 has a beneficial effect on Cardiovascular Disease. New studies are showing that Omega-3 oil benefits might extend to reducing triglycerides. Animal studies suggest that omega-3 can reduce brain levels of the amyloid proteins associated with Alzheimer’s disease and reduce irregular heartbeat. Omega 3 oil helps stabilize the heart and reduce cases of sudden death. Christopher DeGiorgio, professor of neurology at University of California, Los Angeles, has been testing this theory in epilepsy. The American Heart Association (AHA) recommends that people without coronary heart disease eat a variety of fish at least twice a week, and include foods such as Chia seeds, flaxseed and walnuts in the diet. It says people with documented heart disease should eat about one gram of omega 3s a day as it benefits in coronary heart problems. Omega 3 is found naturally in fatty fish such as salmon, mackerel and sardines. The American Heart Association (AHA) says that while omega 3 is generally safe, some side effects can include a fishy aftertaste, gastrointestinal disturbances and nausea. Omega 3 from fatty fish and supplements derived from this source is “essentially” free of mercury the toxic metal sometimes found in fish, some poorly made supplements can contain “appreciable amounts.” These side effects of Omega 3 can be avoided with grain sources of omega 3 like Chia Seeds or flaxseeds. Chia Seeds have no know negative toxicological side effects. 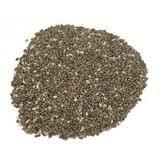 The US Food and Drug Administration (FDA) have determined that Chia Seeds has a history of safe use as a food. Flax is not yet recognized as a food. While Omega 3 has many health benefits it is can thin the blood. Because Chia contains Omega-3 which can thin the blood, if you are taking blood thinners, planning surgery or on an aspirin regiments consult a doctor prior to use.